July’s energies have been so heart-full and supportive of love and togetherness. In these final few days of this month’s energies make sure you find time for the people and things you love. Keep that in mind as we look at the gifts of inspiration which the oracle card Aladdin and the Magic Lamp brings us. This week Aladdin and the Magic Lamp remind us of the power of our dreams. And a dream is never more important than when we are in a hard place, a dark place, a place from which the attainment of that dream seems impossible. Rise up this week. We are being offered hope through the journey of transformation and the promise of wishes coming true. The power is within us. We create our own reality from our thoughts, words, intentions and actions. We hold within us the ability to imagine a better, brighter future for ourselves. The Blood Moon Lunar Eclipse we’ve just experienced has brought up all our old fears, doubts, wounds and shames to be healed and let go. But what will take their place? That’s up to you. So dream it. Imagine it without placing limits on yourself. Then trust in a benevolent universe that will strive to bring you those dreams, giving ten-fold to the energy you yourself put forward. You are beautiful and worthy, and there is an energy within you that is not duplicated anywhere else in the world. Allow the energies of this week to help you understand yourself better, and to anchor yourself in what supports and inspires you. Rose Quartz is a stone of love and nurture – it helps you to be open to the giving and receiving of love. Yellow Obsidian is a gently shielding stone that helps you to think clearly and to break patterns of self-criticism and negative thinking. It aids in looking for positive solutions to life’s dilemmas and for embracing change. Carnelian dispels doubt and negativity, strengthening self-esteem, confidence and creativity. Ruby Zoisite (pictured) is a stone of transformation, helping you to be empowered in your life. It elevates your confidence and authority, and improves fertility, imagination and innovation. I’m loving Young Living’s Forgiveness oil blend this week. Its scent is soothing and uplifting. This blend has 16 different essential oils and resonates to a very high frequency. I often use it on my retreats to facilitate the release of trauma and to help students overcome fear, shame, heartbreak and emotional burdens around betrayal, abuse and abandonment. It opens us to being able to feel worthy of opportunity, and it helps us to positively transform. Place a few drops on soles of feet, wrists, over heart, base of spine and back of neck to help you release negative energy and emotion and move back into a heart-centred space. Want to make your own blend? Lavender keeps us in flow and relaxed, Angelica invites inner peace and a sense of safety, Frankincense elevates our mood and promotes spiritual connection and intuition and Ylang Ylang opens our hearts and is supportive when we feel anxious or overwhelmed. To diffuse add 2 or three drops of each oil to your room or personal diffuser. You can find the oils here. PS: Monday’s oracle card, ‘Aladdin and the Magic Lamp’, is from the Inner Child Cards – A Fairy-Tale Tarot. I use any cards shown as a prompt for channelled messages and my own own intuitive wisdom, so my take is sometimes quite different to the meaning found in a book. The foot chakras are located in the soles of your foot, right about where your foot arches. The colour associated with the chakras in the feet is a rich orangey-brown colour, like terracotta. Your feet chakras anchor you into the healing and calming energies of the earth, and help you to stay centred in your body. When your feet chakras are open and connected you’ll feel at home in yourself and at peace with the world. I’ve added a number of activities to help you with your feet chakras, as this is one of the energy centres most blocked in people. Take your chosen oracle or tarot cards, offer up a small prayer that whatever you do be for your Highest Good, and then shuffle the deck. As you’re shuffling, ask the question ‘What wisdom do my Feet Chakras have for me this week?’ Say it out loud or hold it as a thought in your head. Either will work. Take a large tub of warm water and place a number of smooth stones or tumbled crystals in the bottom. Place your bare feet in the water and roll your feet over the stones until they feel energised. I like to use a variety of crystals that work with each of the major chakras so that I have a rainbow of colour. But I always advise you just to use what you are drawn to. Trust that your own soul knows best what it is you need. Dry your feet and then stand barefoot upon the earth. Look down at your feet and visualise the chakra in the sole of your foot spinning and opening and energetically connecting into the energy of the Earth. Really allow yourself to feel this connection. Shake the tension out of your hands, loosen your shoulders and give your body a good energetic shake out. Now raise your arms up to the sky and draw the energy of the sun and the moon and the stars down in through your hands and the top of your head. Draw the energy of the earth up through your feet. Feel strong like a well grounded tree, roots deep down into the earth. Have all of the energy meet at your heart; healing, balancing and empowering your entire body. Finally, nurture and nourish your foot chakras and help anchor that grounded energy by rubbing a few drops of pure sesame oil into the soles of your feet. Sesame oil also helps us open to abundance and to be comfortable with flow and positive manifestation. Rub your hands together and activate your hand chakras. (Need help to do that? See last week’s post here.) Direct white light energy into your feet chakras. After you begin it is absolutely fine if you feel that you want to change the colour of the energy healing you are giving yourself. When you are finished, shake out your hands, close your eyes and sit quietly for a minute or two. Empty your mind of thoughts and just ‘be’. Come visit us over at facebook. 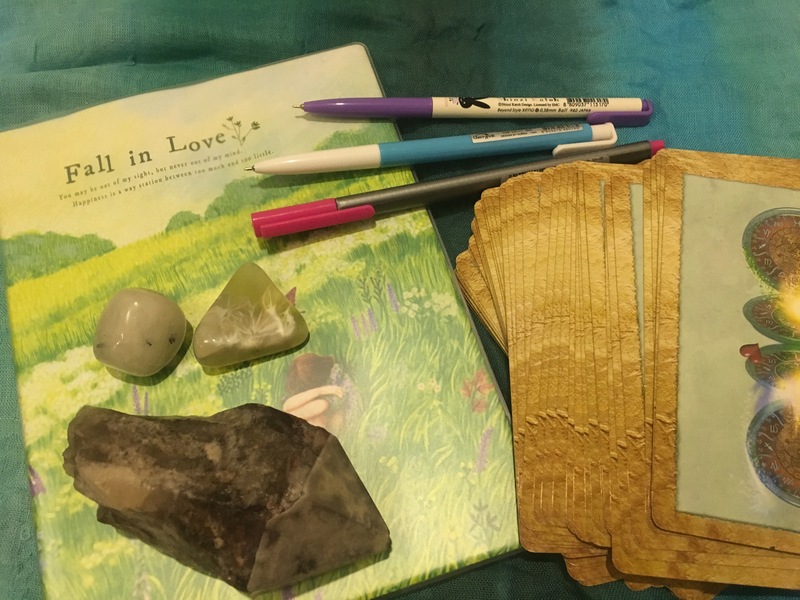 If you like us and post a pic of your journal, crystal and cards this week on our facebook page or if you like and tag us in on your pic over at Instagram you’ll be in the running to win a cool crystal prize! Week One’s prize is a carnelian stone and a nephrite jade stone hand-chosen by me, and all juiced up from being in that recent big crystal grid on my farm. Both are beautiful stones for giving your feet chakras some love. <3 Entries close on Monday 13 March at 6pm Brisbane, Australia time. I’ll announce this week’s winner on next week’s Challenge post. See you next week, ready to explore the second chakra in the Chakra Journal Challenge! Join Me For A New Journalling and Oracle Card Challenge? Keeping a journal is something I’ve done since I was a child. I don’t mean a simple diary, where you record the events of the day. You know what I mean… I ate this. I did this. Someone said that. No. I mean a place where I could explore ideas, talk with myself, and find my own answers. Over the last few years I’ve created several journal challenges here on my blog, and I’ve just made a new one for you, to take advantage of the fabulous energies March and April bring for uncovering the hidden and neglected aspects of yourself, and for determining where you are out of step with yourself, so that you can bring your life into alignment with your true nature and values. It’s a great time for getting to know yourself better and for forging new directions in your life. Would you like to join me? We’ll be starting this new challenge on Tuesday 28 February, so that you have time to gather your resources together. Our first Tuesday will be an orientation day. Then each Tuesday for March and April I will have a new journal activity for you to complete during the week. You’ll need a minimum of ten minutes to set aside each week for writing, and an additional five minutes per day for five out of seven days for energy work on yourself to facilitate your own healing and wellbeing. I’ll teach you everything you need to know. You can be a complete beginner at all of this! I will be using the Chakras as a guide for this challenge. You don’t need to know anything about them either. All you need to do is bring a willingness to know yourself better. A new journal. Choose one that feels right for you. Make sure there are enough pages to get you through nine activities. A deck of oracle or tarot cards. NB: A note on choosing oracle or tarot cards – choose cards whose pictures and messages are meaningful to you. Avoid cards such as tarot decks that show only coins or cups etc. Instead choose a deck whose imagery really speaks to you. It’s the pictures that matter. Don’t worry if you don’t know how to use them. I’ll be showing you. Who’s in? Pop your name in the comments or let us know over on facebook. If you post a pic on the facebook page during this challenge, you’ll be in the running to win a cool prize! Stay tuned for details. Orientation Week – Let’s Learn The Basics!